Flowing from its origins in Horicon, Wis., some 285 miles to where it converges with the Mississippi in Rock Island, Ill., the Rock River was revered by our American Indian ancestors and gave life to many settlements along its banks. Its rolling waters provided transportation, navigation, sustenance and power, helping those communities to grow and prosper. The river continues to define the towns along its shores, from Wisconsin’s Janesville and Beloit, Illinois’ Rockton, Roscoe, Machesney Park, Loves Park and Rockford, to Byron, Oregon, Dixon, Rock Falls and Sterling. Today, it’s a liquid playground offering a variety of sports and activities to residents and visitors. I still don’t know why I fish or why other men fish, except we like it and it makes us think and feel. Anglers in the Rockford area have hooked some record-setters, from catfish to sport fish like muskie. Martin Park, just south of the Riverside Boulevard bridge and directly across the river from Cliffbreakers Resort, has 13 acres with a boat dock, lagoon and easy access to a riverbank shaded with willow trees. Less than a mile south is Shorewood Park, where people fish all along the 35-acre bank. In fact, the catfishing in the Rock is so good here, that on June 25, it became a stop on the King Kat Tournament Trail. Cabela’s, the national sports retailer, sponsors the event in 14 cities nationwide, to promote fishing and involve local anglers in national competition. Open to all, the RBL tournies involve two-person teams in boats, and begin at Sportscore One, 1451 Hiawatha Dr., Rockford. The very first event, held in Beloit, drew four teams; the latest fielded about 15. The RBL helps out each year with the Young at Heart Festival’s Kid’s Fishing Derby in Loves Park, and Angler’s Edge often procures equipment for Cops ‘n’ Bobbers, an event where local law enforcement members fish with local residents. Cabela’s came to the Rock River Valley in 2009, on the recommendation of local fishing guide and catfish angler Matt “Cat” Jones, a frequent contender in Cabela tournaments. “He showed me around the river in Dixon, and it was a fit for us,” says Tanner Tabor, events coordinator and tournament director for Cabela’s. The event was backed by Dixon’s Kodiak Sports, 735 N. Galena Ave. After signing owner Dave “Doc” Rodebaugh as a sponsor, Tabor ran into members of the Chamber of Commerce, who said that Dixon Tourism would be interested in taking part, also. Kodiak Outdoor Sports holds two other fishing events in Dixon, the Jerry Sanders Memorial Catfish Tourney in mid June and a carp tournament in August, and also sponsors the annual Cops ‘n’ Bobbers Fishing Derby in September. Cabela’s added Rockford, and one more area stop – Dubuque, Iowa, will host another $10,000 Super Event on the Mississippi on Aug. 27 – for a couple of reasons. Another was because this year’s Trail finale, the two-day King Kat Classic, will take place in Burlington, Iowa, just a few hours’ car ride for most of these Illinois contestants. Most fishermen talk about the thrill of the hunt, the quiet solitude, the chance for reflection. While many don’t voice it, they also relish the opportunity to help others to experience the joy of their sport. Ainger is president of the Wisconsin chapter of Rock Valley Anglers, a multi-species club that meets once a month to share fishing stories and host speakers. Every year, the anglers make a point of getting rods and reels into the hands of people who might not otherwise fish. Each June, the group pitches in for Free Fishing at the Lagoon, partnering with Wal-Mart, the Izaak Walton League and the City of Beloit to teach kids ages 6-12 knot-tying, baiting, casting and identifying fish. Then, once a week, members take turns, two or three at a time, going to Rotary Park in Janesville to fish with day care clients of Riverfront, an organization that aids adults with disabilities and their families. Beloit has plenty of access for bank fishing, including the handicapped-accessible Wood Family Fishing Bridge, located south of Portland Avenue Bridge. 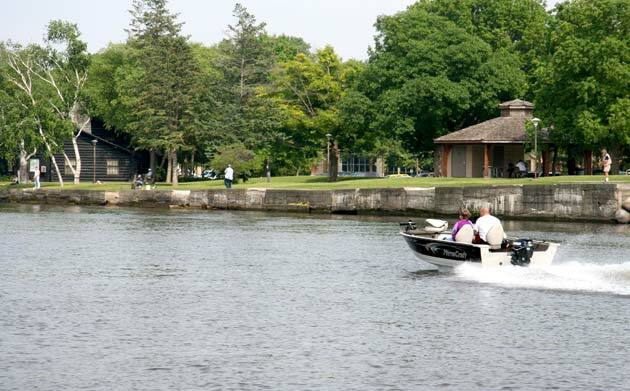 There’s also bank fishing in Wooton Park, 4th Street and Maple Avenue; Armstrong-Eddy Park, north of the Henry Avenue Bridge; and Riverside, the town’s most popular park, on Riverside Drive, offering anglers both river and lagoon fishing. Dieckhoff’s duties include patrolling state public areas, including the river, enforcing regulations for all outdoor sports and providing “a lot” of public education. “We speak and hold demonstrations, and come out for events like Kids’ Fishing Day, held during the annual free fishing weekend in Wisconsin,” he says. Hosted by the Blackhawk Muskie Club at Traxler Park, from 9 a.m. to 4 p.m., kids take part in contests and win prizes. The Rockford Park District encourages youngsters to take up the sport, with its four-week “Get Hooked on Fishing Program,” held at Sportscore One each Wednesday evening, from June 29 to July 20. In Sterling, 30-acre Oppold Marina, 532 Stouffer Road, has docks, a boat launch and bait shop. Sinnissippi Park offers fishing on both the Rock River and the Sinnissippi Bayou. Right in town are Martin’s Landing, a 5-acre park that complements the three-year-old Sinnissippi Dam Walkway; and Lawrence Park, 25 acres on an island that’s split by Avenue G.
In Rock Falls, boats can put in at Arduini Boat Launch, above the dam, and at Seward Riverside Park below. West of the 1st Avenue Bridge, Lower Dam Park has a boat ramp, benches and plenty of space for fishing from the bank. simply messing around in boats. With the water too shallow for powerboats below the dam in Oregon, the 5- to 6-hour canoe trip to Dixon is quiet and peaceful. For shorter jaunts, paddlers can get to Castle Rock in two hours, and to Grand Detour in about four. Welty knows the trips well; until last year, Rock River Outfitters rented out canoes and kayaks and he took those trips often. “Age was the biggest reason we stopped,” he says. While water below the dam is too shallow for speedboats, above the dam is a different story. “From Oregon to Byron, for a stretch of about 10 miles, the water is deeper,” says Welty. “There’s ample water to do anything you want above the dam.” That includes jet skiing, skiing and tubing, boat fishing or just floating along in a pontoon boat. Right: The Rock Aqua Jays Water Ski Club, Janesville, Wis.
Tyler Smith, who grew up on the river in Rockford, has been boating his entire life, and skiing since age 5. Now, whenever he’s not busy running his landscaping business, he’s on the river. “I ski three mornings a week, at 6 a.m., when there’s no traffic,” says Smith. “Then, I ski at 6 p.m. with the Rockford Ski Broncs.” The local water ski show team, which was incorporated in 1967, is made up of amateur water skiers from elementary school age to retirement. 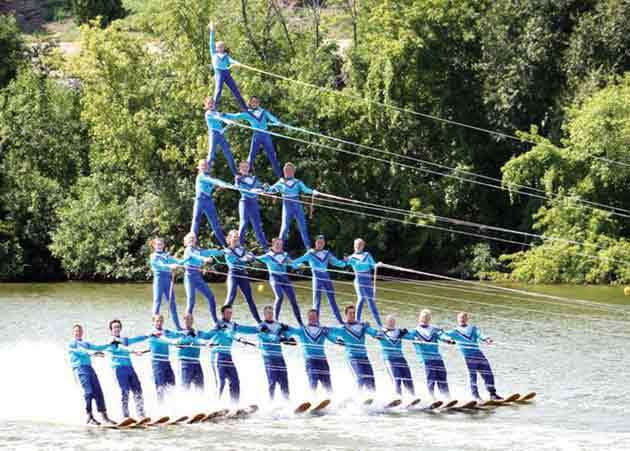 The Ski Broncs belong to the National Show Ski Association, and compete in sanctioned events like ballet, barefoot and swivel skiing, freestyle jumping and human pyramid building. Besides maintaining a rigorous practice schedule, both indoors and out, the members put on 30 to 35 public performances each season. Those include shows held each Wednesday and Friday evening, as well as one on July 4, at 7 p.m. at Shorewood Park in Loves Park – the team’s home court, as it were. The Division 1 National Tournament will be hosted by the Rock Aqua Jays (RAJ), at Traxler Park in Janesville, Wis. This team, which placed second in last year’s event, marked its 50th anniversary this year, with special activities held over the weekend of July 1-3. The team performs each Wednesday and Sunday evening at RAJ Stadium in Traxler Park, and takes part in Janesville’s big Independence Day on the Rock celebration each July 4. For Independence Day, boaters crowd the river in all of these towns to watch fireworks shimmer over the water. What better symbol of freedom? Up and down the river, gathering spots for boaters and other water-lovers are well-known. The Rock Bar & Grill, 101 Maple Ave., Beloit, has docks where boaters can pull in for a snack, meal or drink, daily from 11 a.m. In addition to an outdoor patio and Tiki bar, it offers a sand volleyball court and beanbag toss. There are slips for private rental, and riverfront grounds and tents for private events like weddings or reunions. It also has a pontoon boat available for half- or full-day rentals. In Rockford, the Prairie Street Brewhouse, 200 Prairie St., is both popular and practical. Renting out 50 to 60 boat slips each year, with one public dock and the only gas pump in this area, it’s a must-stop for boaters. The former brewery is now owned by CMM & Associates and rented out for banquets, weddings and organizational events. Development plans include condos, restaurants and office space. On Thursdays, the owners offer a full bar and dining from 5 to 10 p.m., with live music from 6 to 9 p.m. The food is provided by Backyard Grill & Bar, and the talent is mostly local, mostly acoustic – The Jodi Beach Trio, Emily Hand, 3 Good Men. Sandbars offer boaters the chance to visit on the water. “Up near Atwood Forest Preserve, there’s a shallow spot where people pull up, get out of their boats and socialize in the water,” says Smith of the Ski Broncs. In Dixon, this spot is known simply as “the island.” Years ago, it was called Van Arnum’s Island, with vacation homes and a Coney Island-type midway. Now, a group of pelicans stops at the island for several days each spring during their migration. Adjacent to the Assembly Park boat launch, the island’s tip furthest from the dam is a gathering place for boaters. “One side is very muddy, but the other has a nice, sandy beach,” says Pam Cunningham of Polo, Ill. A Dixon native, she and husband David put in their boat upstream at Lowell Park, and then cruise down river, sometimes pulling friends and relatives on a tube. They almost always stop at the island, where they’re certain to see any number of relatives and friends. Down in Sterling, Moonlight Bay Marina and Restaurant has a campground, marina, boat launch and storage, and a full restaurant and bar. Campers frequent the restaurant, but many boaters up and down the river dock and come in for a drink or a meal. The face of the water, in time, became a wonderful book … And it was not a book to be read once and thrown aside, for it had a new story to tell every day. 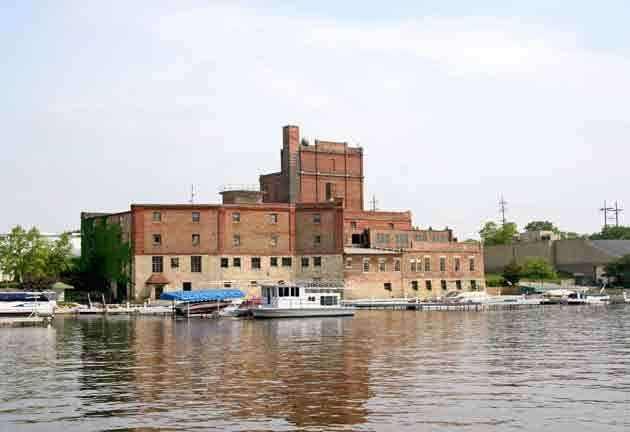 The Rock River has two excursion riverboats between Janesville and Rock Falls – one modern, and the other an honest-to-goodness paddle wheeler. In Rockford, the Forest City Queen is a custom-built, water taxi-style riverboat, owned by the Rockford Park District, that offers public rides and private cruise rentals from the first week of June through fall. Rides lasting 45 minutes are offered on the hour during summer months, on Wednesdays and Fridays from 2 to 4 p.m., and on weekends from noon to 4 p.m. Also, on Fridays through Sept. 30, visitors can take a 30-minute Grab-n-Go Lunch Cruise, with trips departing at 11:30 a.m., 12:15 and 1 p.m. Box lunches include a burger, hot dog or chicken sandwich, along with chips and a drink. Tickets are purchased at the Trolley Station in Riverview Park, 324 N. Madison St., and the boat departs from its dock next to the Riverview Ice House, just a few yards away. Because the first cruise Friday of the summer was a cool, cloudy day, lunch passengers were slim, a lucky break for the employees at the ice rink. The park district also offers dinner cruises on Wednesday, Friday and Saturday nights, from 6:30 to 8:30 p.m., even taking in Ski Broncs shows. Starting on Sept. 10, 60-minute public rides will be offered on Saturdays and Sundays at noon, 1:30 and 3 p.m. Built in 1979, the Forest City Queen was a gift to the Park District from The First National and North Towne banks. It’s 48 feet long, weighs 13 tons, and seats 49 passengers, or 32 for dinner. A typical weekday cruise attracts 25 to 30 people. “This is a great asset in town that many people haven’t tapped into,” says Rankins. Aboard the Forest City Queen, Capt. Reggie “Pete” Peterson and First Mate Caitlyn Baylor share tidbits about Rockford. As the boat passes under the Riverside Boulevard Bridge, Baylor points out that its canopy clears with only a few feet to spare. “The designer knew about the low clearance here, so he designed the boat specifically to make it under this bridge,” she says. Between narratives, Baylor chats with guests, and Peterson recruits some of the younger passengers to help him to steer the boat, such as Bianca Martinez of Rockford. She and mother Adriana Guerrero, first-time riders, were brought by family friend Carlos Gonzales. Another family is from Wichita Falls, Texas. They came with repeat rider Grandma Pamela Cleary of Rockford. Coast-Guard certified Peterson, who’s always been interested in boats and the water, has been captain of the Forest City Queen for 10 years. The Freeport, Ill., resident was piloting a water taxi on the Mississippi in Dubuque, Iowa, when he learned that Rockford had a riverboat. He applied, and has been at its helm ever since. The Pride of Oregon is an authentic paddlewheel boat, designed specifically for use on the Rock River. Docked at Maxson Riverside Restaurant on Ill. Rte. 2, the flat-bottom, split-paddlewheeler was built and delivered in 1989. Wiesner has a U.S. Coast Guard Master’s License and was running a coho salmon fishing boat out of Burnham Harbor in Chicago when he discovered that the boat was being built. He applied and became its captain before it was even completed. The boat is locked in to the north by the Hwy. 72 bridge in Byron, and to the south by the Oregon dam. Wiesner takes passengers on two-hour sightseeing jaunts or dining cruises, covering about 15 miles total, at a speed of about 7 mph. Lunch and dinner cruises are offered Monday through Saturday, and there’s a Sunday brunch. The boat can be reserved for banquets and special events. It’s heated and air conditioned, and Wiesner says he’ll run sightseeing cruises for as few as four, though it’s best to check a day or two ahead. The river offers up new sights daily. This entry was posted on Friday, July 15th, 2011 at 11:57 am	and is filed under Features, Top Posts. You can follow any responses to this entry through the RSS 2.0 feed. Both comments and pings are currently closed.